James Oldfield returns to Benslow Music in 2019 to guide singers through the art of consort singing, and we'll enjoy some sight reading challenges whilst exploring the riches of secular music from Monteverdi to Barber. Participants can also suggest and bring favoured repertoire. Excellent sight reading and the ability to hold a line, sustain a phrase, and stay in tune are all essentials, and there will be the opportunity for singing one voice per part in small groups as well as a chamber choir. 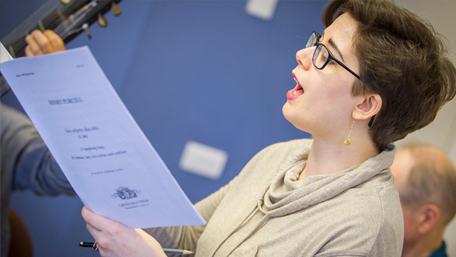 This course is ideal for instrumentalists who play at a high level and wish to transfer their chamber music skills into a vocal context. An enjoyable, relaxed and inclusive atmosphere whilst making music at a high level.